As we head into another summer movie season full of action, dudes built like mack trucks, and explosions galore, I thought it would be fitting to take a step back to an earlier time before films were all about spectacle and marketing tie-ins. Close Encounters of the Third Kind is, in many ways, the best kind of science fiction even though there are virtually no explosions and we only get glimpses of aliens or spaceships until the very end. 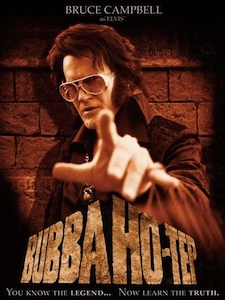 Directed by Steven Spielberg, one of the masters of the genre, it follows the story of average dude Roy Neary (Richard Dreyfuss, fresh on the heels of another little movie he did with Spielberg) who gets a tad too close to an alien spaceship one strange night while out in his pickup truck investigating a widespread power outage. Over the next few days he starts having visions of an object that he feels compelled to re-create in paintings, clay, and mashed potatoes at the dinner table. Meanwhile, other people around the country are having similar visions and experiencing otherworldly phenomena, most notably Barry Guiler, a kid with a curious bent who wanders a bit too far from his mom one night only to get picked up by the invaders. Throughout all this we never actually see the aliens–only the effect they are having on the people who claim to have experienced these encounters. While North America is being sent into a tizzy trying to deal with the strange phenomenae, entire squadrons of missing World War II aircraft are discovered in the desert in mint condition. It’s these strange events that cause French scientist Claude Lancombe to investigate the matter further, leading to the eventual discovery of a probably location for an alien landing site along with five distinct musical tones that might possibly lead to a method of communicating with the extra terrestrials. Keep in mind there’s no gunfights, and no national monuments are singled out for destruction. In many ways, Close Encounters of the Third Kind more accurately resembles a cerebral thriller or mystery like Inception or Vertigo rather than a traditional science fiction movie, but it’s these qualities that make it anything but traditional. And yet, Spielberg keeps things engaging and interesting throughout, while building up to a climax that is as massive in scope as anything we might see in a multiplex today. 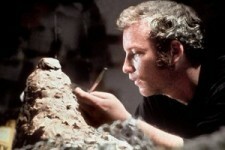 Roy Neary, searching for meaning in a pile of clay. Just as E.T. was first and foremost a story about divorce that also happened to involve aliens from another planet, Close Encounters is a story about family that is struggling to stay together despite the father’s descent into madness. Roy Neary is a good guy who is overcome with strange visions, and pushes his family away while they struggle to deal with changes they cannot hope to understand. The focus is kept squarely on Neary’s quest for understanding, Jillian Guiler’s search for her son, and their refusal to accept anything other than concrete answers. Strangely, there is little to be found in the way of redemption, as Neary makes some very unexpected choices near the end–choices that Spielberg himself has since admitted he would change if he were to make the movie today. 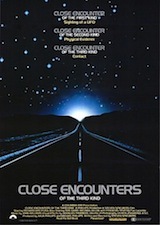 But these unconventional choices made by Neary lend an authentic quality to the movie that is fairly unique in modern cinema, and coupled with the stunningly realistic special effects that can easily hold their own against anything Hollywood has to offer today, catapult Close Encounters to the upper echelon of cinematic science fiction. 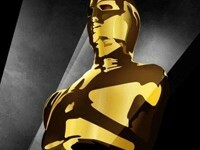 This one is not to be missed by anyone who is a fan of the genre, or anyone who just likes good movies.